Whether facing a journeyman such as Barney Schultz or a fellow Hall of Famer like Steve Carlton, Cubs icon Ernie Banks produced some of his most spectacular performances against Cardinals pitching. In a 19-year playing career with the Cubs, Banks had 512 home runs, 1,636 RBI and 2,583 hits. Against the Cardinals, Banks batted .277 with 326 hits in 324 games, including 64 home runs. All of that talking became too much for Cardinals ace Bob Gibson. Gibson drilled Banks in the ribs with a pitch. “He didn’t have much to say to me after that,” Gibson said. Banks had a career batting mark of .229 (24-for-105) against Gibson with three home runs and 13 RBI. Banks hit two home runs on April 16, 1955, but the Cardinals won, 12-11, in 14 innings at St. Louis. In the second inning, Randy Jackson, Banks and Dee Fondy hit consecutive home runs off Tom Poholsky. With the score at 9-9 in the 12th, Banks and Fondy connected for back-to-back homers off Schultz. The Cardinals tied the score in the bottom half of the inning on Wally Moon’s two-run homer with two outs off Bubba Church. 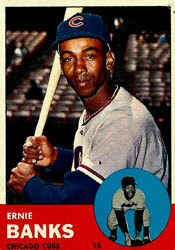 Three months later, on July 8, 1955, Banks again homered twice against the Cardinals. This time, the Cubs won, 6-4, in 11 innings. The home runs gave Banks a season total of 23, most for a shortstop in one year since Glenn Wright slugged 22 for the 1930 Dodgers. In a five-game stretch against St. Louis in July 1955, Banks hit .550 (10-for-18). Ten years after his 12th-inning home run off Schultz, Banks hit another dramatic shot against the Cardinals knuckleball pitcher. On April 12, 1965, in the season opener at Chicago, the Cardinals carried a 9-6 lead into the bottom of the ninth. With two outs and none on, Tracy Stallard walked Ron Santo and Altman followed with a single. Red Schoendienst, in his debut as manager, replaced Stallard with Schultz. Banks powered a three-run homer “into the teeth of a 20 mph wind,” according to the Associated Press, tying the score at 9-9. At 39, Banks hit a pair of two-run home runs off Carlton _ the first giving the Cubs a 4-3 lead in the sixth and the second snapping a 4-4 tie in the eighth _ but the Cardinals rallied and won, 8-6, at St. Louis on June 29, 1970. Composer Burt Bacharach, Banks’ self-described No. 1 fan, was in St. Louis for a concert and was greeted by Banks outside the clubhouse after the game. “You were making beautiful music out there,” Bacharach said to Banks.